So I wanted to write this post to help those of you that are new to embroidery get a brief overview of some of the techniques, tools or terms that you may hear in your quest to learn more about embroidery. What I’ve come up with is just a very small selection of what embroidery encompasses but I thought it would be a good place to start. 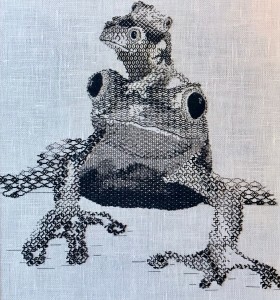 Applique is an embroidery technique which involves applying fabrics on top of one another to create different layers and textures, resulting in an embroidered picture or pattern. These layers can be padded with felt, carpet felt, pelmet vilene or soft string. The edges of the applied fabrics can be finished in a variety of ways too. For example, couched, corded or frayed. They can be turned under and slip stitched or have a decorative stitch edge such as blanket stitch or long and short. Blackwork is a counted thread technique, traditionally worked on a linen and dating back to the 1500’s, where it was widely used to decorate collars, cuffs and sleeves. As the name suggests it is worked in varying thicknesses of black thread to create different depths, shadows and light contrast. There are 100’s of counted thread patterns ranging from a simple zig-zag to a more complicated diamond eyelet. Couching is an outline stitch that can also be used to cover raw edges of applied fabric as described in appliqué. A number of core threads (depending on the thickness required, more core threads can be added) are placed together and laid on the line or edge you wish to work. A separate thread is secured to the fabric and is taken over the core threads to hold them in place. The stitches over the top should lay at 90 degrees to the core threads and ideally be spaced about 3-4mm apart, although this does vary depending on the scale you are working. Drawn thread is a traditional Whitework technique, where threads from the linen fabric are withdrawn to create areas of open space. The remaining threads (warp or weft, depending on which you withdrew) are then twisted and knotted into various patterns. Elizabethan Twist is a gold thread used in goldwork. It is made up of two plys of gold thread that has been twisted to give a very subtle and delicate sparkle. It can either be couched down in the normal way, or it can be stitched down as if you were applying a cord, by slightly untwisting the gold and taking the needle between the two plys so that the stitch is hidden. Make sure to take the needle down in the direction of the twist though. Ah the simple French Knot, this is a small and neat knot which creates a lovely texture when grouped together. Even though they look simple, it can be tricky to get an evenly tensioned knot. Make sure to keep the thread taut the whole time and that should help. 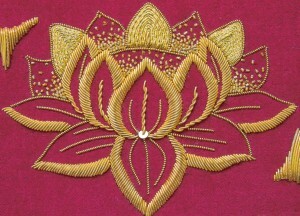 Goldwork is a decorative embroidery technique that involves a wide variety of techniques under the one umbrella. Traditionally used in ceremonial and military embroidery, in recent years it has seen a significant move towards the fashion industry where it has appeared on catwalks, most notably Dolce & Gabbana’s AW12 show. There are a wide variety of padding techniques that sit under the various types of gold. For example, there’s couched passing, generally used for filling in areas, Pearl Purl used for outlining, chipping which gives a wonderful sparkly texture and cutwork – probably the trickiest to master as the purl used is very delicate. I will touch more on this wonderful technique in a future post but for now this will have to do. Another whitework technique, Hardanger is a regional form of embroidery from the mountains at the head of the Hardanger Fjord in Norway, that has kept a well defined character. Designs are traditionally geometric patterns such as squares, diamonds and zig-zag borders. Geometric snowflakes, hearts and crosses also a common. Hardanger is another counted thread technique that uses a combination of Kloster blocks, overcast bars, woven bars and picot fillings. Italian smocking is just one form of smocking that was, as the name suggests developed in Italy. The gathering stitches follow a grid pattern and are worked evenly in and out of the fabric. When the gathering threads are pulled up, the pleats fall into an elaborate symmetrical pattern. Not at all like the small, regular pleats of English smocking. Ah Jacobean, for those of you that know me (and if you don’t but want to learn a little more head here), you will know how much I love Jacobean Crewelwork. 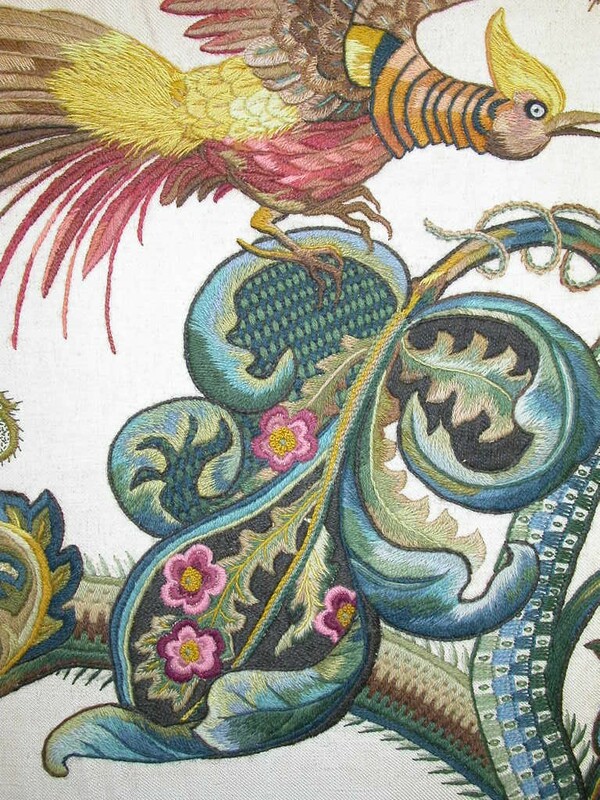 Jacobean Crewelwork was the outcome of earlier wool embroidery. During the sixteenth and early seventeenth centuries, large grand houses were being built which increased the demand for furnishing textiles such as cushions, wall hangings, curtains, fire screens and bed hangings which were decorated with Crewel embroidery. Today a wide variety of stitches is used to create textural designs, such as long and Short, raised stem band, whipped and woven wheels, satin stitch, vandyke, cretan, fishbone, fly stitch……. the list goes on. If you want to go more in depth with this subject check out my post on the history here. Knotted Pearl stitch is only a stitch I have recently come across and used. It is a textural outline stitch that comes out rather chunky as the knot is worked twice. Now I am not talking about the ladder stitch used to sew two fabric together. I am talking about the whitework variety where a back stitch is worked along the line you wish to stitch. A couching thread is then laid down either side of the back stitch. From there the couching is held down whilst opening up the previous back stitch holes. 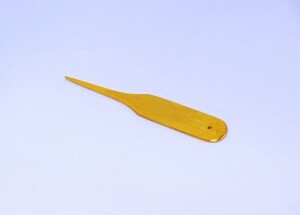 A mellor is a laying tool that is mostly used in goldwork. It has a pointed end which is used to lay cutwork and chips and it helps to lay multiple threads flat and smooth. The other end is a flat paddle shape which is great for smoothing out curves and straight lines in Pearl Purl. Needlelace is technique that is widely used in Stumpwork. Generally it comes in the form, or variation of a buttonhole stitch. The shape that is to be filled with needlelace is first outlined with a couching stitch or wire, then the needlelace can be worked inside, filling the shape. Often these are detached from the base fabric that it sits on to be worked and then applied to a padded form. Depending on the thread used it can create a very delicate pattern that is often used for clothing stumpwork figures and is not too dissimilar to knitting in it’s looks. Or Nue is a goldwork technique. Quite simply it is Japanese thread or passing that has been stitched down with colour to create the design. The gold is laid in vertical, parallel rows and the design couched over the top, leaving the shimmer of the gold coming through. Areas that do not require colour would still be couched down in the same way, just with a matching gold thread so the stitches are discreet. Ok, so technically not embroidery but I do love beads and beading techniques. Peyote stitch is an off loom bead weaving technique that can be worked in a cylinder shape or flat. The stitch produces a brick pattern. There are many varieties of quilting and it is fair to say that quilting derived out of necessity. People from as early as the Middle Ages needing to keep warm discovered that by layering up fabrics it would keep them warmer. And that’s what quilting is, the layering up of fabrics with often a wadding in between. There is also Trapunto quilting where outlines of shapes are stitched through two layers. The backing layer is then cut and wadding is stuffed between the two layers of that shape. There is also corded quilting where again outline stitches are worked through two layers of fabric and then a cord is run in between the two layers. A form of whitework embroidery where designs have been worked with a buttonhole edge. Woven bars with picots are then worked free from the fabric to join the design areas together. The fabric between the designs is then cut away leaving the buttonhole bars to maintain the integrity and shape of the design. 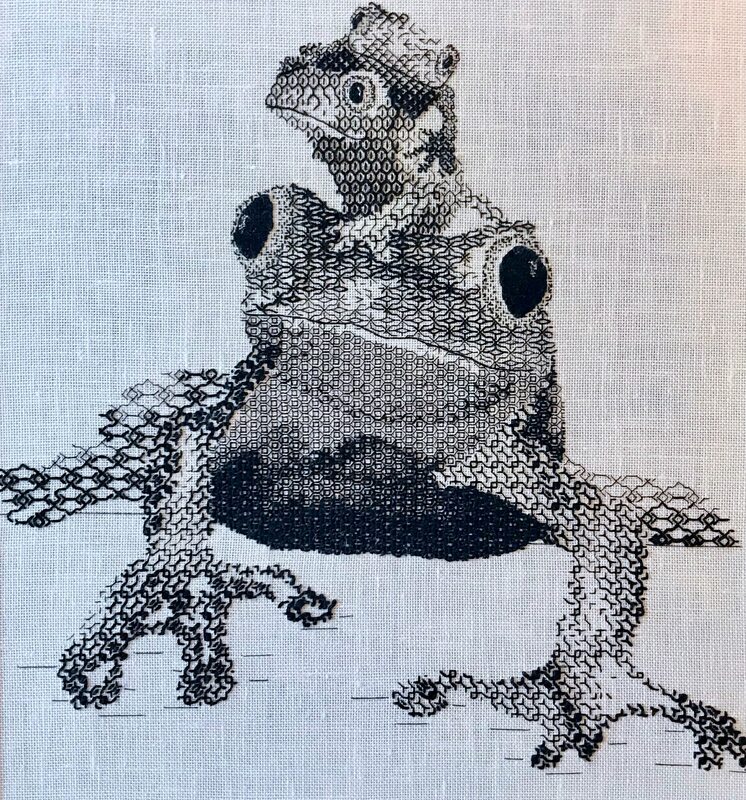 Stumpwork is a three dimensional embroidery technique that includes raised elements and wired shapes, developed in the 17th Century. Traditionally is was mostly used on caskets worked by young, wealthy children and seen as part of their education. A stumpwork casket was the ultimate, final piece and what all their previous training in embroidery had been leading up to. If you want to learn more about Stumpwork then check out this post. Tambour beading is the quick way of applying beads and sequins. I say quick, it does take some practice to build up speed and confidence but once mastered it really is wonderful. Worked from the reverse of the fabric and with a hook, the beads or sequins are strung onto a spool of thread. The hook collects the thread either side of the bead or sequin and the thread is pulled through the fabric creating a chain stitch. The bead is then held in place. If you want to learn more about the history click here and if you want to have a go yourself then head to my shop where I have a kit available. Underside couching was used in medieval times for the most part on Ecclesiastical Vestments, due to the stitch being very durable and allowing a lot of movement in fabric. 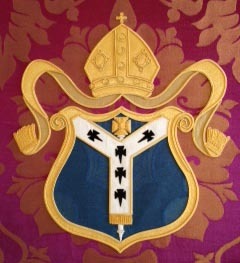 Traditionally the core thread would be worked in a gold thread and couched down. The couching stitch is pulled tight to pull the gold thread through to the underside of the fabric. Sarah Homfray has a great video tutorial on how to do this. 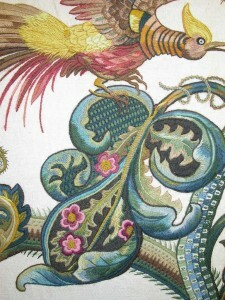 Vandyke stitch is often used in Crewelwork and is quite a textural stitch. It produces a ladder like stitch with a plaited vein that runs through the centre. Webbing is used when framing up the fabric ready for embroidery. When using a slate frame, after the fabric has been stitched to the slates, top and bottom the webbing is stitched along both sides of the fabric. Then using a bracing needle, string is taken through the webbing about every inch. The string then allows you to tighten the fabric evenly whilst the webbing prevents the fabric underneath from being overly damaged, giving you the perfect tight fabric to work on. X or cross stitch is used in canvas work and as the name suggests is a X shape. The first stitch worked runs from bottom right to top left and then the stitch over the top runs from bottom left to top right. Keeping these consistently the same is the key to a neat X stitch. There are many varieties of X stitch that create great texture and cover the canvas well. Ok, so I had trouble coming up with an embroidery term that began with Y but you can’t beat youtube for some educational videos on how to work a stitch. This is something I hope to do more of over the coming year. Used when stitching two fabrics together that sit edge to edge or to help prevent the edges of a fabric from fraying. I hope you have enjoyed this little insight into some embroidery terms. This is just a very basic list and if I was to sit here and write about all of them then that would be the rest of my life taken care of. Grateful for introducing to vast array of real stitching from A to Z.